Last week, Inspiration Mars announced plans to send two human beings in 2018 on the 501 day trip around Mars and return to earth. 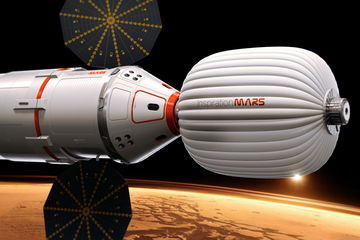 Inspiration Mars is the brain child of the first space tourist, Dennis Tito. Dennis has announced he will invest up to $100M into Inspiration Mars to fund the effort for the next few years while Inspiration Mars raises the necessary billions ($1-2B) to fully finance the venture. Although Inspiration Mars is a non-profit, here are a few revenue generating ideas to assist with financing. Some of the ideas below won’t generate revenue until after the mission completes. These ideas don’t matter if you can’t raise significant(!) investment/donations from rich individuals. However, these ideas might help Inspiration Mars grow beyond a single success. The mission may require Aerocapture on earth return. If the first mission is successful, Inspiration Mars will become the experts in Aerocapture. Market Aerocapture solutions for future missions. Post Mission, Expertise in HW, SW, and Ops could be packaged and sold through involvement in follow-on deep space missions. I am sure I missed a bunch of revenue ideas. Send me your thoughts and we can add them to this list. Good luck Inspiration Mars. We are all rooting for you!